Finishing my Rare Replay games, Blast Corps feels like an odd dead end. It was built to be a building destroying game, and so that’s what we’ll be doing. We apparently have a variety of vehicles to work with, but I’m not sure what a jetpack will do for us here. At least we’re not shooting ourselves out of a catapult like we did previously in Pain. For a game that relies on destruction, the controls need to feel good. Unless you’re playing a game where awkward controls are the point of the game, you need to make sure you have decent control so you can aim your destruction at least somewhat accurately. While this might have been the switch from Nintendo 64 to Xbox one controllers, there’s something awkward about the controls which didn’t feel quite camera or vehicle relative and changed a bit over time. This is of course vehicle dependent. Blast Corps has you take several vehicles through the game, most of the levels limiting you to a subset of the eight available. A carrier makes its way through the level, its course blocked by several buildings. You need to destroy them by bumping in them somehow – driving bigger vehicles into them, stomping them or in at least one case, launching yourself into the sky and landing on top of these buildings. Some of these are easier than others, not helped by some needing fuel or ammo to keep doing their thing. Control of these aside – and there are obviously clear differences – the levels are quite cool. The graphics are not hing complicated, but there’s a lot to destroy and enough secrets to keep things entertaining even after you clear the path for your carrier. Not only can you increase your score, there are some secrets to be found as well. 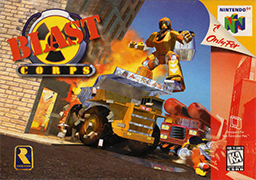 Blast Corps is one of those games that sounds simple, but creates enough variety to stay playable and create challenges. The difficulty curve is decently balanced, always giving you multiple levels to go to while not feeling out of reach. Some vehicles get too difficulty to control, which turned into roadblocks for me, but it takes a while before we reach that point.